In this Third Sunday of Easter, our readings remind us that Jesus is the Messiah prophesied throughout all of the Hebrew Scriptures. Peter proclaims this in our first reading and Jesus himself "opened their minds to understand the Scriptures" as he appeared to his disciples that first Easter Sunday night. 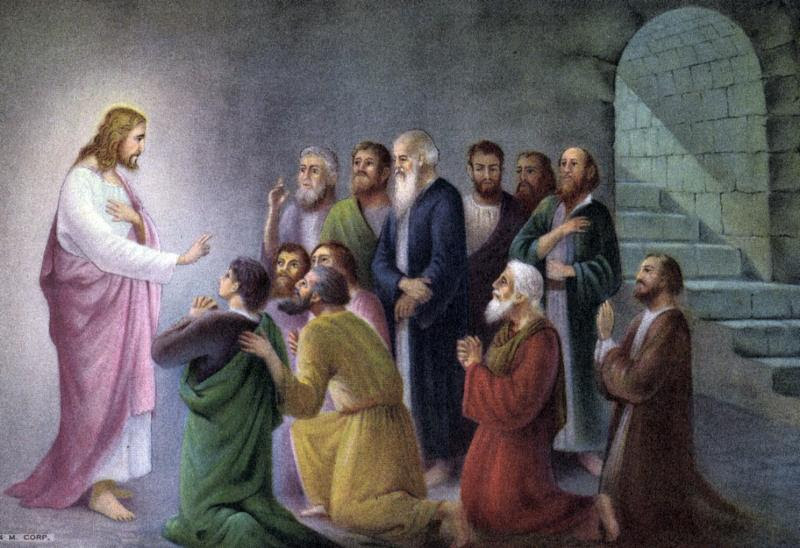 In our first reading (Acts of the Apostles 3:13-15, 17-19), St. Peter speaks to the crowd gathered just after he healed the cripple at the "Beautiful Gate" of the temple. He proclaims the risen Christ as the "suffering servant" of Isaiah foretold long ago, raised up by the God of Abraham. He calls them to repentance and conversion. Peter said to the people: "The God of Abraham, the God of Isaac, and the God of Jacob, the God of our fathers, has glorified his servant Jesus, whom you handed over and denied in Pilate's presence when he had decided to release him. You denied the Holy and Righteous One and asked that a murderer be released to you. The author of life you put to death, but God raised him from the dead; of this we are witnesses. Now I know, brothers, that you acted out of ignorance, just as your leaders did; but God has thus brought to fulfillment what he had announced beforehand through the mouth of all the prophets, that his Christ would suffer. Repent, therefore, and be converted, that your sins may be wiped away." In our Gospel reading (Luke 24:35-48), we hear Luke's telling of that first Easter Sundaynight, when Jesus appeared to his disciples. The two disciples who were on the "road to Emmaus" have just told of their encounter with Jesus. Then Jesus appeared to the group and showed them that he is alive and not a ghost by showing his wounds and sharing a meal with them. Then he "opened their minds" to all that was written about him and commissioned them to preach the Gospel of repentance and forgiveness in his name. "He said to them, "These are my words that I spoke to you while I was still with you, that everything written about me in the law of Moses and in the prophets and psalms must be fulfilled." Then he opened their minds to understand the Scriptures. And he said to them, "Thus it is written that the Christ would suffer and rise from the dead on the third day and that repentance, for the forgiveness of sins, would be preached in his name to all the nations, beginning from Jerusalem. You are witnesses of these things." In our Epistle reading (1 John 2:1-5), St. John calls us to repentance but offers comfort that when we do sin, Jesus the Advocate will intercede for us. He is expiation for our sins. "My children, I am writing this to you so that you may not commit sin. But if anyone does sin, we have an Advocate with the Father, Jesus Christ the righteous one. He is expiation for our sins, and not for our sins only but for those of the whole world. The way we may be sure that we know him is to keep his commandments. Those who say, "I know him," but do not keep his commandments are liars, and the truth is not in them. But whoever keeps his word, the love of God is truly perfected in him. Our readings remind us that from the very beginning, it is God's plan that the Christ would suffer and die for our sins and that we would be offered forgiveness and right relationship with the Father. St. John tells us that to know Jesus is to keep his commandments. May we know Jesus!